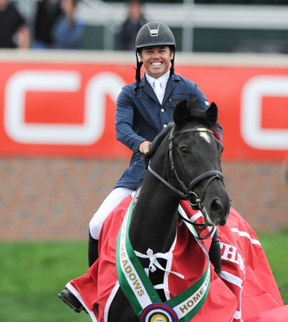 The biggest prize money purse on offer at the ‘National’ Tournament was in the$400,000 CN Reliability Grand Prix, CSI-W 5*, and it was Kent Farrington (USA) who took home the winner’s share for the second year in a row with Uceko. Reed Kessler (USA) Cylana finished second, while Charlie Jacobs (USA) and Flaming Star were third. There were 36 entries in the grand prix, but only four were able to clear the first round course set by Werner Deeg of Germany. Fifth place went to Kirsten Coe (USA) and Baronez, who had two time faults. First to return in the jump-off was Eric Navet of France on Quanto Fino 2, a 10-year-old Oldenburg gelding by Quick Star x Stutbuch 1 owned by Signe Ostby. They had an unfortunate rail at fence 10b and finished with four faults in 54.99 seconds for fourth place. The next three riders would all be clear and the winning time fell with each start. Charlie Jacobs and Flaming Star, a 14-year-old Swiss Warmblood gelding by Fairman owned by CMJ Sporthorse LLC, would put in a neat clear round in 53.62 seconds, which slotted them in third place. Reed Kessler and her Olympic partner Cylana were next in, and they galloped through the timers in 50.05 seconds. They would have to wait and see what the final rider would do. Entering the ring as reigning champions of the competition, Farrington and Uceko, a 12-year-old Dutch Warmblood gelding by Celano x Koriander owned by RCG Farm, picked up a quick pace going to the first jump and never looked back. They had to stretch over a wide oxer halfway through the course, and then went flat out across the ring in the long run to the last two fences. Their speed paid off as they stopped the clock in 48.73 seconds for victory. Farrington was very happy with his win on Uceko, a reliable, successful partner of his for years. “Right now in his career, he’s basically learned everything there is to learn. Now it’s my job as a rider and a horseman to manage his career, to pick the right venues and the right classes to aim him towards so I can make his career last as long as possible. With as much money as there is now in the sport, it’s a matter of managing horses so that they can be at their best when it counts,” he said.